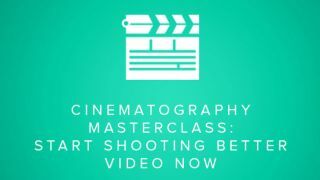 Learn tricks of professional film makers and make your videos shine by working your way through this bootcamp. While the best films may look effortless, they take an incredible amount of work. It's a matter of having the right tools and knowing how to get the most out of them. You can learn how to make the most of your resources by studying the Videography Bootcamp, on sale now for just $39 (approx. £28). The Videography Bootcamp will give you the advice that industry experts took years to learn. From making the most of your DSLR camera to making use of tools like drones, utilising green screens and cinematographic tricks, and even editing your film like a pro – there are lessons in this bundle for every level of film maker. Work your way through 33.5 hours of content spread over eight professionally taught courses and you'll see your work improve right in front of your eyes. You can get the Videography Bootcamp on sale now for just $39 (approx. £28). That's a saving of 97 per cent off the retail price for a course packed with valuable filmmaking lessons, so grab this deal today.